Let us now praise peonies.. Species peonies to be precise. Who does not admire the sumptuous exuberance, the voluptuous colors and textures that suggest the same sorts of things marketed by Victoria's Secret. 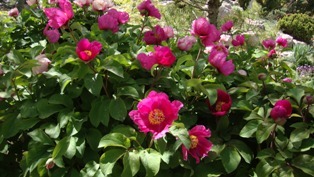 And I don't mean lingerie...peonies are frankly the sexpots of the garden. The hybrids are Zsa Zsa Gabors and Sophia Laurens. The species bring to mind more lissome and willowy heroines like Catherine Deneuve or perhaps Kate Winslet. 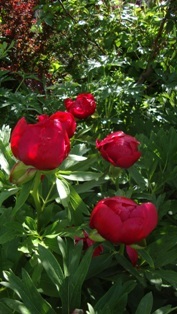 The fabulous scarlet peony of the Balkans, Paeonia peregrina, marks a high point of spring in my garden. I make visitors pause and worship at its shimmering magnificence: it's as if Halle Berry just walked into the garden! 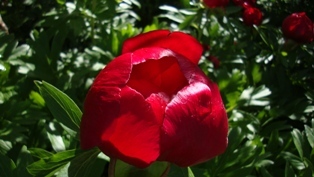 It's been a few weeks since the glorious Paeonia kavachensis--a rare variant of P.mascula from Russia--put on this amazing display in the Rock Alpine Garden. It reminds me of a tough beauty, like Lauren Bacall. 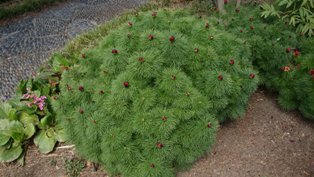 Even in bud these wonderful plants are irresistible. 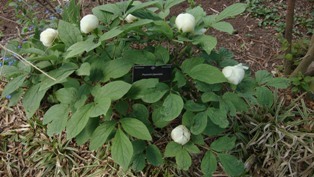 This white gem reminds me of Gwyneth Paltrow, don't you think? 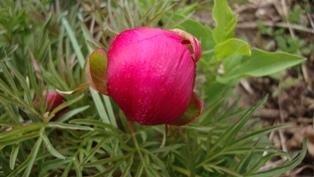 But who to compare the billowy charms of Paeonia tenuifolia when it is just coming into bud early in May? 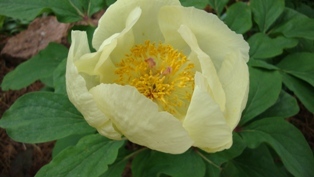 But for me the queen of species peonies is Molly the Witch, the rare yellow peony of the Caucasus. It invariably blooms for the Mother's day Plant Sale. It took me years, but I finally found one to buy and planted it at home: now I feel that I have Grace Kelly visiting each time I look out and glimpse her from my back window.